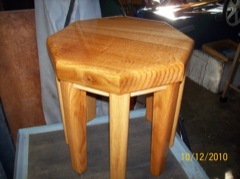 Stool #5: First stool in White Oak - First stool with rounded edges - First stool from standing dead tree (airport). I have often heard that trees that stand dead for a time produce poor quality lumber. This stool is made from 'firewood' that I'd cut from a white oak that had stood dead for many years before we cut it down. While splitting the wood for the stove, I found the grain and texture interesting enough that I sawed (chainsaw) a couple chunks and set them to dry in my greenhouse instead of burning. I spend as much time finishing the bottom side as the top because I think it as at least as interesting. For one thing, the legs appear to be splayed out (sort of an optical illusion). I could also envision young people playing with the stool upside down - I think I would if I were young (oh what the heck, I DO play with these upside down.